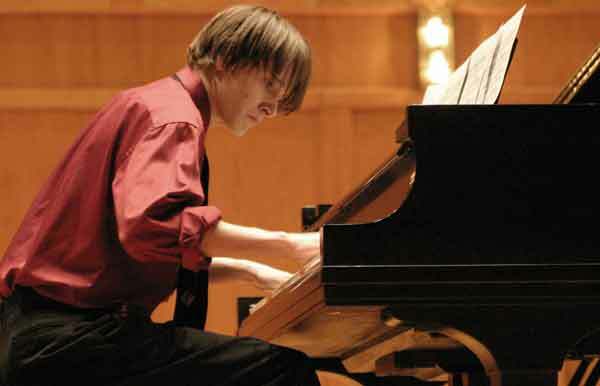 Senior Takes on the "Most Demanding Music"
Kyle Prifogle ’09 will top off his musical career at Wabash playing one of the most challenging pieces ever written for piano during his Senior Recital Friday at 8 p.m. in Salter Hall. "Gaspard de la Nuit" by Maurice Ravel is one of the most difficult and demanding compositions for piano, both technically and musically," said Prifogle’s piano teacher Diane Norton. "In my 36 years at Wabash, no pianist has attempted to perform this composition, and, in fact, it is rarely performed publicly because it is a challenge to both the performer and the audience." Prifogle, who won last year’s Phi Beta Kappa Prize after his junior recital, will also play Beethoven's "Sonata in F Minor, Opus 57" ("Appassionata") during Friday evening’s program. "Mathematics and music are truly my two passions," Prifogle said. "I don’t think I am the kind of person who for whom one or the other would suffice. They are things that I do, not to show off, not for monetary gain, but simply because I can’t do without them." The senior has put in long hours preparing for Friday’s recital. "During certain times of the year, when I am finishing up a project, I will tell people that I live in Goodrich Hall, which is where I do my math work," Prifogle said. "During times around a recital, I will tell people I live in the the Fine Arts Center, which is where I play the piano." The Ravel piece Prifogle will play Friday has personal connections for his teacher. "I am particularly pleased that Kyle has chosen to perform "Gaspard", as the last movement was dedicated to my own teacher, Rudolph Ganz," Norton said. "My own studies with Ganz emphasized the contemporary piano repertoire, with a concentration on the music of Debussy and Ravel, and hopefully contribute to Kyle's interpretation of this daunting work." Prifogle is also completing an independent study with Norton on "Gaspard" within the context of cultural trends in France during the first part of the 20th century. He will present a lecture about his discoveries and observations next Thursday at 12:10 in Korb Classroom. Friday night's recital is free and open to the public.